Steris Plc (NYSE:STE) was in 22 hedge funds’ portfolios at the end of December. STE shareholders have witnessed an increase in activity from the world’s largest hedge funds in recent months. 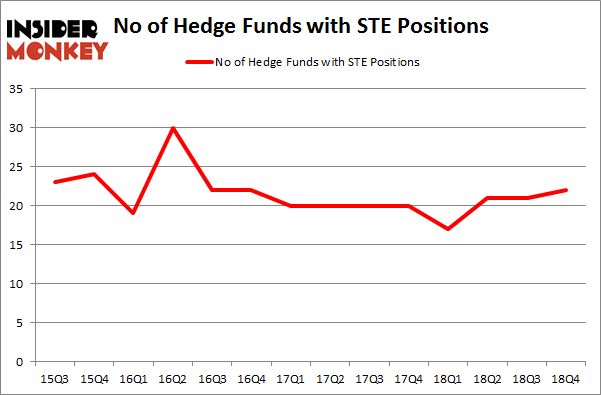 There were 21 hedge funds in our database with STE holdings at the end of the previous quarter. Our calculations also showed that STE isn’t among the 30 most popular stocks among hedge funds. Let’s take a peek at the key hedge fund action regarding Steris Plc (NYSE:STE). What does the smart money think about Steris Plc (NYSE:STE)? At Q4’s end, a total of 22 of the hedge funds tracked by Insider Monkey were bullish on this stock, a change of 5% from one quarter earlier. The graph below displays the number of hedge funds with bullish position in STE over the last 14 quarters. With hedge funds’ positions undergoing their usual ebb and flow, there exists a few noteworthy hedge fund managers who were adding to their holdings substantially (or already accumulated large positions). The largest stake in Steris Plc (NYSE:STE) was held by Fisher Asset Management, which reported holding $150.4 million worth of stock at the end of September. It was followed by Millennium Management with a $64.9 million position. Other investors bullish on the company included Citadel Investment Group, Echo Street Capital Management, and GAMCO Investors. With a general bullishness amongst the heavyweights, key money managers have jumped into Steris Plc (NYSE:STE) headfirst. D E Shaw, managed by D. E. Shaw, assembled the largest position in Steris Plc (NYSE:STE). D E Shaw had $3.4 million invested in the company at the end of the quarter. Ray Dalio’s Bridgewater Associates also made a $0.9 million investment in the stock during the quarter. The other funds with brand new STE positions are Minhua Zhang’s Weld Capital Management, Paul Marshall and Ian Wace’s Marshall Wace LLP, and Alec Litowitz and Ross Laser’s Magnetar Capital. Let’s go over hedge fund activity in other stocks – not necessarily in the same industry as Steris Plc (NYSE:STE) but similarly valued. We will take a look at W.R. Berkley Corporation (NYSE:WRB), Noble Energy, Inc. (NYSE:NBL), Masco Corporation (NYSE:MAS), and Twilio Inc. (NYSE:TWLO). All of these stocks’ market caps are closest to STE’s market cap. As you can see these stocks had an average of 32.25 hedge funds with bullish positions and the average amount invested in these stocks was $849 million. That figure was $297 million in STE’s case. Twilio Inc. (NYSE:TWLO) is the most popular stock in this table. On the other hand W.R. Berkley Corporation (NYSE:WRB) is the least popular one with only 23 bullish hedge fund positions. Compared to these stocks Steris Plc (NYSE:STE) is even less popular than WRB. Considering that hedge funds aren’t fond of this stock in relation to other companies analyzed in this article, it may be a good idea to analyze it in detail and understand why the smart money isn’t behind this stock. This isn’t necessarily bad news. Although it is possible that hedge funds may think the stock is overpriced and view the stock as a short candidate, they may not be very familiar with the bullish thesis. Our calculations showed that top 15 most popular stocks among hedge funds returned 19.7% through March 15th and outperformed the S&P 500 ETF (SPY) by 6.6 percentage points. Hedge funds were also right about betting on STE, though not to the same extent, as the stock returned 15.7% and outperformed the market as well. 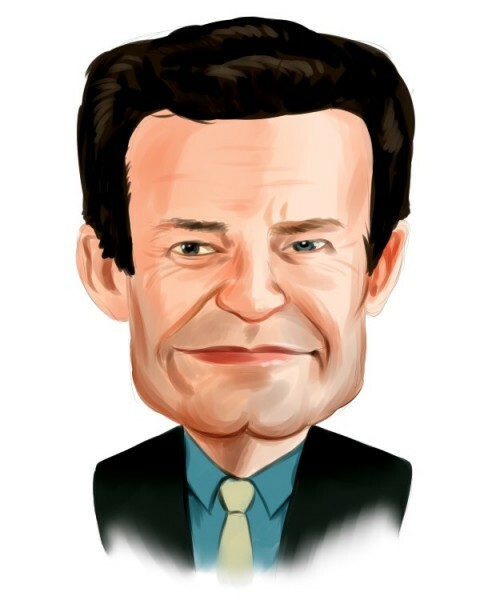 5 Ways to Play the Autonomous Driving Trend 4 Ways To Play the Ride Sharing Trend 5 American Companies that Will Benefit From the End of the Trade War Were Hedge Funds Right About Souring On Teck Resources Ltd (TECK)? Sarissa Capital Management Hires New President Were Hedge Funds Right About Souring On News Corp (NWSA)?